Gertrude Esteros still recalls the day she knew she’d see the world. It was spring. She was picking strawberries next to a wooded area on her parents’ farm near Saginaw, Minn. She was 7 years old. 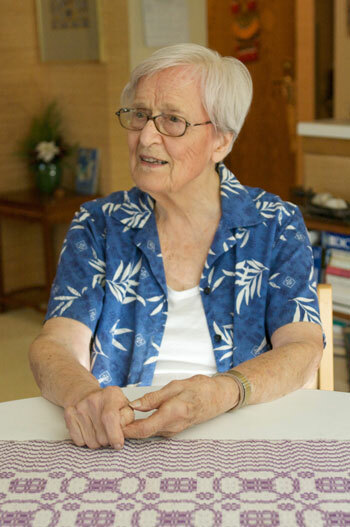 Nineteen years later, on Dec. 7, 1941, Esteros began to realize her childhood vision as she stood in a crowded college auditorium and listened to President Franklin D. Roosevelt announce over the radio that the Japanese had just attacked Pearl Harbor. Within months Esteros quit her teaching position at Linwood College near St. Louis, Mo., and joined the American Red Cross. She shipped off to the South Pacific in December 1942 and served in the Pacific Theater until the war ended in 1945. Seven decades have passed since the United States was drawn into World War II. Esteros is now 97 and living in a condominium at 1666 Coffman, the sprawling white University of Minnesota senior complex on Larpenteur Avenue in Falcon Heights. Her home is filled with pieces of art that map Esteros’ efforts to see the whole world: an altar piece from India, masks and carvings from New Guinea, a wooden peasant creche from Poland, a granary door from Mali, prints from fellow faculty members. Esteros (pronounced “es-te-rose”) retired from the university in 1980 after building an impressive resume that includes heading the Department of Design for 30 years and founding the Goldstein Gallery (now the Goldstein Museum of Design). A housing expert, she took a lead role in developing the building she now lives in. She’s a quick-witted woman who says she wouldn’t have lived so long without a sense of humor. Her body is wearing out, she says with a shrug. Her arthritis troubles her and she depends on a walker to get around, but she can hear well and continues to participate in groups she’s been involved in for years. She holds meetings at her dining room table and attends lectures at 1666, where she still heads the community’s garden club. Esteros was 27 when she decided to put her career on hold and head into a war zone. Describing herself as “something of a pacifist,” Esteros felt she needed to do something to help the people involved in the war. Her parents told such detailed stories of their homeland that when she finally traveled to Finland, her mental image of the country was quite accurate, she said. She hasn’t lost her ability to tell a good yarn. While entertaining a visitor at her home recently, Esteros pulled a carved wooden bowl shaped like a fish from a nearby shelf. “This is the story of my going on a trip to a village while I was in New Guinea,” she began. One Saturday morning in New Guinea has stayed with her: “It was a free day and some men soldiers said they were going to go on a trek to visit a village.” She was eager to join them. “I wanted to see something more than just our G.I. encampment and the hospital life,” she said. Esteros sat on the ground and the women gathered in a circle around her. A little girl climbed onto her lap and Esteros saw the head man peer around some trees. “He smiled so broadly,” she said. “I think he was so pleased that I was getting along with his wives and his children.” Eventually, Esteros put her shirt back on and went back to the men. As the group of Americans were leaving the village, “the head man came and gave me two gifts: a spear and a bowl shaped like a fish, and as I understand it this is a ceremonial bowl, though I do not understand what kind of ceremony it was. As the war progressed, Esteros was relocated to the Philippines where she worked in hospital wards as the casualties mounted. Though she had “marvelous experiences” serving with the Red Cross, she also experienced much horror. When Esteros looks back at her work during World War II and her long life, she sees her ability to laugh as the thread that has made it a satisfying near century. “If I didn’t have positive ways of thinking, I don’t think I would have lived to 97,” she said. “You can’t live with hate. It does bad things to you. It messes up the organism.” With that last statement, she lets out another deep laugh and then looks at her guest: “This is why we told stories during the war with the GIs. You just wouldn’t have made it if you couldn’t have laughed. ‘There is so much absurdity; there is nothing more absurd than war. 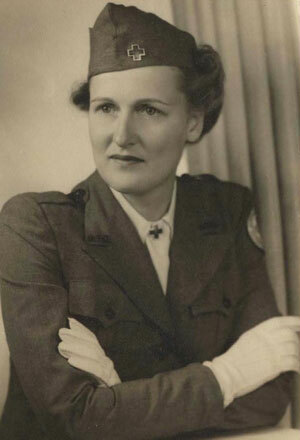 Gertrude Esteros is featured in the Minnesota Historical Society’s exhibit The Greatest Generation. You can read more about her time in the war at http://stories.mnhs.org/stories/mgg/war. Next PostVoices: Where were you when you heard about Pearl Harbor?